A small, inexpensive microrobot built on a single circuit board has been created by an international team of researchers. Different modules allow the robot to communicate, move, store energy, and collect data. 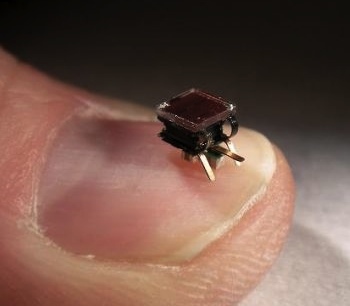 The tiny robots, less than 4mm in any direction, contain a solar cell on top for power, and vibrating legs, three of which they use to move and one that acts as a touch sensor. Although not powerful as individuals, the intent is to use the I-SWARM (intelligent small-world autonomous robots for micro-manipulation) concept to create ravening hordes of tiny robots working in concert to destroy even the mightiest works of man! Well, okay, maybe that's getting a bit ahead of the actual technology. However, older readers of Stanislaw Lem have been nervously scanning their surroundings for these things ever since the 1954 publication of The Invincible. "...I believe them to be very tiny pseudo insects that, if necessary, and for their common good, can unite to form a superordinate system. This is the course taken by the evolution of the mobile mechanisms." I'd also add a reference to a more structured version of this idea, the Robot Cells (Crystal-Shaped Modules) from 1987 work by Michael P. Kube-McDowell. A small flock of prototype multiple-rotor radio-controlled aircraft are being taught basic surveillance strategies. If possible, learn from the experts. Via PhysOrg and Evaluation of building technology for mass producible millimetre-sized robots using flexible printed circuit boards (abstract only).